The oil and gas sector is among the six core industries in India and plays a major role in influencing decision making for all of the other sectors of the economy. The Government of India has adopted several policies to fulfill the increasing demand. The government has allowed 100 percent foreign direct investment (FDI) in many segments of the sector, including natural gas, petroleum products, and refineries, among others. Today, India attracts both domestic and foreign investment, as attested by the presence of Reliance Industries Ltd (RIL) and Cairn India. Backed by new oil fields, India’s domestic oil output is anticipated to grow to 1 MBPD by FY16. With India developing gas-fired power stations, consumption is up by more than 160 percent since 1995. Gas consumption is likely to expand at a CAGR (Compound Annual Growth Rate) of 21 percent over the coming years. Presently, domestic production accounts for more than three-quarters of the country’s total gas consumption. India increasingly relies on imported LNG; the country was the fifth-largest LNG importer in 2013, accounting for 5.5 percent of global imports. India’s LNG imports are forecasted to increase at a CAGR of 33 percent through 2017. State-owned Oil and Natural Gas Corporation (ONGC) dominates the upstream segment (exploration and production), accounting for approximately 68 percent of the country’s total oil output (FY14). Indian Oil Corporation Limited (IOCL) operates 11,214 km network of crude, gas and product pipelines, with a capacity of 1.6 MBPD of oil and 10 million metric standard cubic metre per day (MMSCMD) of gas. This is around 30 percent of the nation’s total pipeline network. IOCL is the largest company, operating 10 out of 22 Indian refineries, with a combined capacity of 1.3 MBPD. INTECSEA is actively engaged in the Indian O&G market. Our Hyderabad office has been taking enthusiastic measures of establishing strategic partnership with the country’s oil and gas operators. INTECSEA is proudly supporting projects for ONGC. Similarly, INTECSEA has established strong bonds with smaller oil and gas operators within India such as H-Energy, ESSAR etc., and is leaving no stone unturned in establishing contacts with giants such as BG, Reliance, IOCL etc. India is an ever increasing market from a global stand point, with oil and gas giants such as Shell, BG, and BP already underpinning the Indian oil and gas sector, and others such as ExxonMobil investing about US$ 500m. Clearly, there is a promising future in the Indian oil and gas sector. 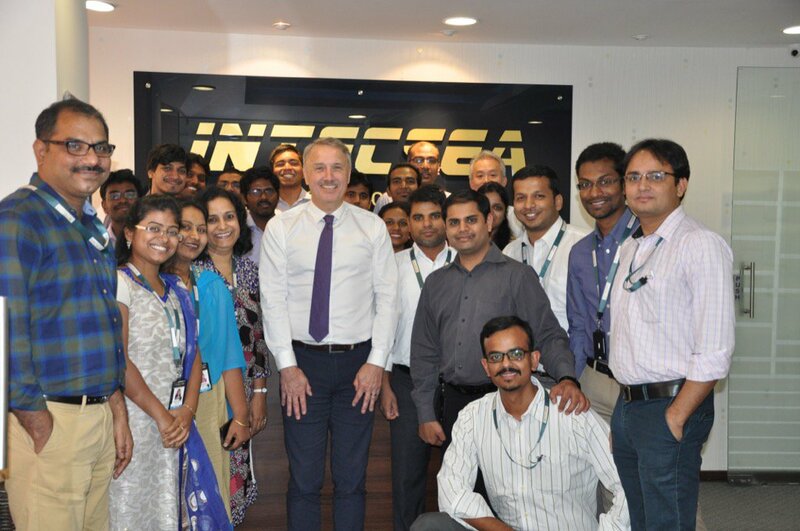 INTECSEA sees a great deal of opportunity in India; we look forward to continuing investment and using our versatility in spearheading the sector in the future!